Columbia, Mo. (Jan. 27, 2016) — More than 20 professional journalists from around the country and five Missouri journalism students will attend a nuclear energy workshop at the Missouri School of Journalism Jan. 28-29. “The Promise & Perils of Nuclear Energy: A Workshop for Journalists” is aimed at educating journalists and journalism students on the benefits and risks of nuclear science for energy production, health care and research. The workshop features tours of the University of Missouri Research Reactor (MURR) and the nearby Callaway nuclear power plant operated by Ameren. In addition, panel sessions open to the public will feature experts on topics such as nuclear physics, the economics of energy and nuclear safety. Among the 15 local and national speakers are journalists Roger Witherspoon and Kari Lydersen, a representative of the Nuclear Energy Institute, Kevin Kamps of Beyond Nuclear, and nuclear safety expert David Lochbaum from the Union of Concerned Scientists. Journalists registered for the nuclear energy workshop will tour the University of Missouri Research Reactor. Photo courtesy of MURR. At a time where science literacy is low and the media are prime sources of information about science policy and health issues, the workshop will help journalists expand their scientific knowledge on the often-controversial subject of nuclear energy. The Missouri School of Journalism, the world’s first journalism school, has a longstanding commitment to science journalism. The late Joye Patterson, who started teaching science writing at the school in 1966, is credited by colleagues for inventing the modern approach to teaching science writing, combining narrative techniques and scientific data. Students and faculty today carry out a broad program of science communication research and media production. The nuclear energy workshop carries on the School’s time-honored “Missouri Method” technique of hands-on learning. In addition to exploring environment and energy issues, the workshop will feature the MU Research Reactor. 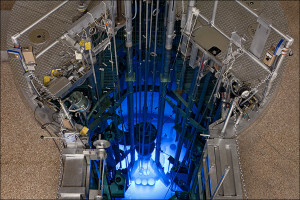 MURR is the most powerful research reactor on a university campus in the United States and focuses on biomedical research and services, such as creating radioisotopes and providing irradiation services. William H. Miller, professor emeritus of nuclear engineering at MU, will lead a tour of the facility. Kattesh Katti, Curators’ Distinguished Professor of radiology, physics and a senior research scientist at MURR, is one of several MU researchers who will present their work. Attendees will also get a tour of Ameren’s Callaway nuclear plant, Missouri’s only commercial nuclear unit. Panel discussions are open to the public and will be live-streamed at www.rjionline.org/live. Those wishing to follow along on Twitter can use the hashtag #nuclearworkshop. Also open to the public is a screening of the documentary “Pandora’s Promise,” to be followed by a panel discussion with experts. The workshop is hosted by the Missouri School of Journalism and the Reynolds Journalism Institute and funded by Mizzou Advantage, the Jonathan B. Murray Center for Documentary Journalism, and the Association of Health Care Journalists. For more information, including times and locations of sessions open to the public, visit the Promise & Perils of Nuclear Energy website. Katherine Hambrick is a senior science and agricultural journalism student at MU.